While heading to South L.A. for the United Riders of South L.A.‘s Tour de Watts this past Saturday, I was reminded of a guest lecture I gave in a USC journalism class a few weeks ago. For an hour and a half, I talked about how fortunate I felt to be covering South L.A. and how wonderful and welcoming the people there were. We talked about the problems, of course, and about the importance of taking a nuanced approach to get behind the typical perceptions of the area and its inhabitants. But, I thought I had done a pretty good job of painting a portrait of the South L.A. I know: the one that varies greatly from neighborhood to neighborhood; the one filled with good people whose ability to be good neighbors to one another is sometimes constrained by challenging circumstances; and the one that isn’t always easy to wrap your arms around but which rewards you tenfold for the effort. Then, I got their evaluations. Most had enjoyed the talk immensely and many even found themselves inspired to think about using a bicycle to get to know a community (huzzah!). But, the majority seemed to be incorrigibly wedded to the idea that South L.A. was a seedy and unsafe place. Not because they’re terrible people, or racist, or even classist — I don’t believe they are. Simply put, that’s just how powerful the stereotypes surrounding South L.A. are. What does it take to take people’s minds? I wondered as I pedaled down Avalon. Sometimes I feel like I can write about how great the people of South L.A. are til I am blue in the face and it won’t make a bit of difference. Part of the reason, I would guess, is that I still have to write about the problems I see there. Crime, gang-activity, blight, intense poverty…those things are real. And, they do negatively affect the population. In fact, just as I was rushing to meet up with the riders at the WLCAC, I ran into a young man I knew on the corner of Century at Ted Watkins park. His fixie had gotten a flat, he said, and he was walking to get his van so he could pick up the bike, which he had left at the park with friends. What he was telling me, essentially, was that, even though he was a strong, grown man, walking a bicycle a few blocks down the street by himself on a sunny Saturday morning would serve as an invitation for people to take it from him and possibly hurt him in the process. It’s a story I’ve heard a million times. The unfortunate reality for people in Watts and other parts of South L.A. is that the streets are not all that secure for pedestrians. Or for young cyclists, for that matter, if they are out riding on their own. It is also a story I don’t enjoy telling because it seems to confirm the negative stereotypes of the area. And, while it does confirm them to some extent, there is a lot more to the story. In that story, I hear the frustration of residents at having their mobility hampered by the less-than-honorable folks that control the public space. I hear people wanting something better for their community, but not feeling like they have the power to make that change on their own. I also hear resignation — an acceptance of the fact that this is the way things have been for so long and this is the way they will continue to be unless some form of help or investment from the outside finally arrives. 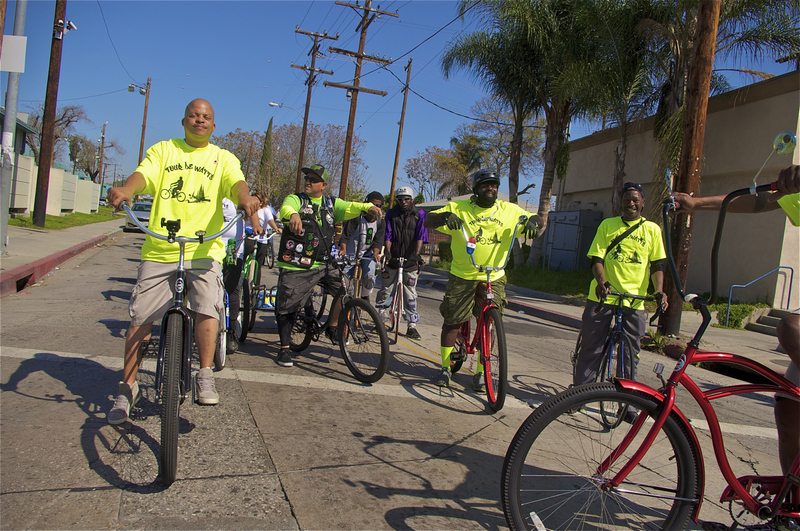 Those sentiments are what make what the East Side Riders Bike Club (ESRBC) and Los Ryderz are doing in Watts so important. 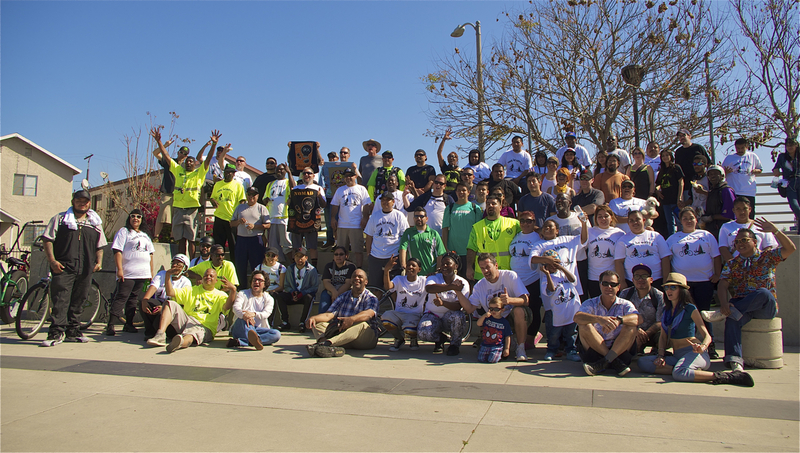 Banding together under the name “United Riders of South L.A.” and proclaiming “No Color Lines” as their tagline, they regularly organize unity rides, are active in supporting community-building events, have launched their own summer kickball league to keep youth busy on Friday nights, are working to pull more South L.A. bike clubs under the United Riders umbrella, and are building relationships with clubs from outside the area. In doing so, they are showing that, even in an area where black-brown tension can run high, people from all races can work and play together. They are also communicating that the streets can be for recreation and that people have a right to enjoy them safely — even in the housing developments. Too often, street parties and events have to take into account gang activity in the area. 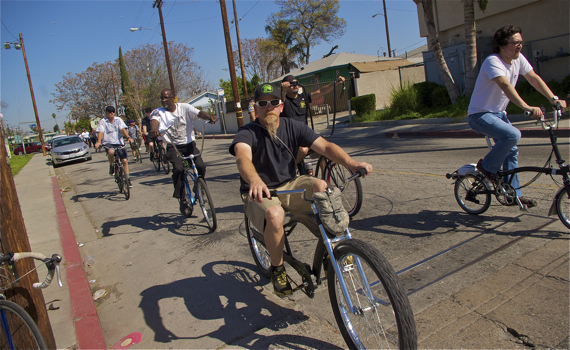 On the first Tour de Watts two years ago, for example, I remember one of the Los Ryderz youths nervously calling out to founder Javier Partida, “J.P., it’s the PJs [Watts Crips]!” as curious gang-bangers gathered in Imperial Courts to give the stank-eye to the cyclists moving through their territory. In another incident that year, a car driven by gang-bangers had pulled up alongside the red-shirted Ride4Love participants and shouted out their affiliation with Grape Street (Crips who favor blue). As the United Riders’ movement has grown, those incidents seem to have diminished. Instead, as they turned into Jordan Downs this past Saturday, parents who often don’t allow their kids to play outside came out to stand in their yards with them and wave. The same happened in Nickerson Gardens and Imperial Courts (the two other big housing developments in the area); kids waved, people cheered, and others asked what cause the group was riding for. People seemed especially excited to see the group in Nickerson Gardens. A number of people were already out when we arrived; many were observing a group from outside of Watts that had come to help work in the community garden there. It is something that happens quite a bit — a group will come in from the outside to help out and residents will watch from afar, wary of the motives of the outsiders or not trusting that their help will be anything more than a one-off feel-good sort of project. The arrival the Tour riders seemed to catch them off guard. They hadn’t expected such a large, home-grown contingent of cyclists to come pedaling through. But, it clearly pleased them to see leadership coming from their own community. They joked with the riders and shouted encouragement as we made our way back toward the WLCAC. After the ride, I spent a long time chatting with staff from the Advancement Project (an organization that does safe passages and gang intervention work in the area), Tim Watkins (the CEO of the Watts Labor Community Action Committee), and John Jones III about the value of these kinds of events for the community and more innovative ways to engage hard-to-reach residents in more positive endeavors. 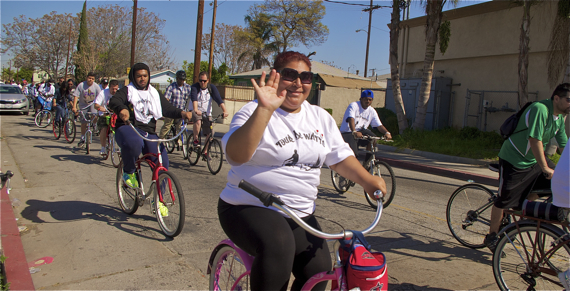 It was kind of par for the course — the community rides in South L.A. often serve as the excuse to open the ongoing dialogue we all have been having for years about the problems facing the neighborhood and ways we can do more to build on the goodwill the events generate to foster change. Seeing positive momentum finally beginning to build from within the community itself is really exciting. Last year’s Tour de Watts had between thirty and forty riders. This year, they hit about 100. 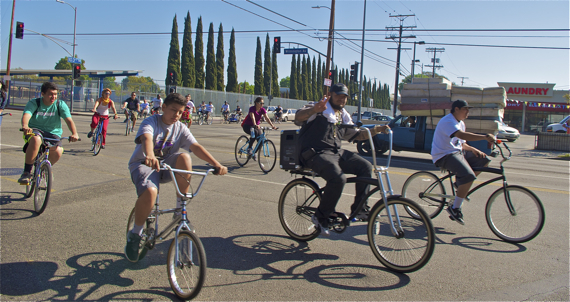 And, while many of the additional riders came in the form of bike clubs like the Cyclone Coasters or the Chopaderos, the bulk of the new riders were from South L.A. Which means that the United Riders have managed to convince residents and often-hard-to-reach youth that good things can come from getting up early on a Saturday morning to show love for the community. These are the things that I wish I could help people unfamiliar with South L.A. to see — that good people abound in the area. And that they come in the unorthodox form of former gang-bangers who now smile, offer well-wishes to onlookers, and talk about going to college, the bike club leaders and supporters who use money from their own pockets to make sure local youth can take a spin with them or that they are fed after a ride, or the people who are not all that well-off themselves making sandwiches for the homeless. 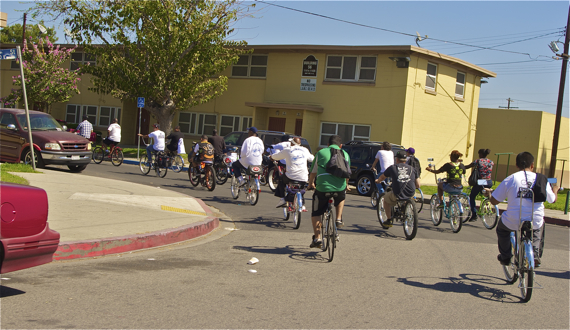 Young men may not yet be able to walk down the street on their own with their bikes, but the rise of the bike clubs shows there is a growing number of people in the community who are dissatisfied with the status quo and dedicated to upending it, one ride at a time. If you’d like to ride with the United Riders, they will be riding to feed the homeless this coming Saturday at 9 a.m. For more information, contact Los Ryderz or the East Side Riders. For more photos from the Tour de Watts, click here. What an uplifting, positive story on how the bicycle can bring communities together. It’s nice to see homegrown heroes who actually live in and are invested in the community make a difference for the positive changes the residents seek. Thanks for writing and informing folks in LA about the goings on in South LA. One of the many things that I appreciate about Sahra’s writing is that she somehow manages to counter people’s negative stereotypes about people and places while not sounding judgmental or self-righteous about it. That’s a tough balancing act, and I don’t know that all that many people pull it off so well. It seems to me that that tone is what has the best chance of changing the minds of people who are at least potentially open to having their minds changed. A positive report from an area that normally gets covered only in “police blotter” items and TV reports showing memorial displays for victims of violence. Did any of the major TV stations send camera crews to cover this event? To the author: I wish I could truly express how much I admire the work that you do. It’s so incredibly refreshing to hear thoughtful and nuanced journalistic perspectives like this on the neighborhoods of South LA. Thank you for doing what you do! 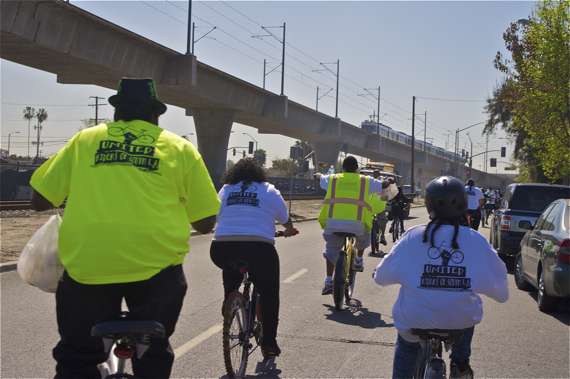 Tour de Watts: Join us for an event to celebrate the launch of Streetsblog in South L.A.
POSTPONED Tour de Watts: Join us for an event to celebrate the launch of Streetsblog in South L.A.